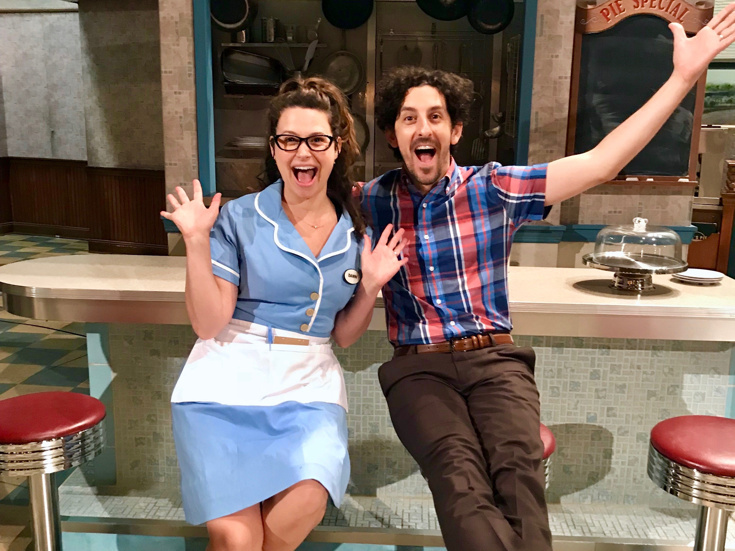 Katie Lowes & Adam Shapiro on the set of "Waitress"
The hit Broadway musical Waitress will welcome real-life married couple Katie Lowes (Scandal) and Adam Shapiro (Steve Jobs) in the roles of Dawn and Ogie, respectively, on July 17. The pair will make their Broadway debuts, replacing current stars Caitlin Houlahan and Christopher Fitzgerald. In addition to her acclaimed work on Scandal, Lowes is the co-artistic director of IAMA Theatre Company in Los Angeles, where she has been featured in Accidental Blonde, Assistance and A Dog's House. Her film work includes Transformers 2, Super 8, Wreck-It Ralph, Frozen, Big Hero 6 and Zootopia. Shapiro is the co-founder of IAMA Theatre Company, where his credits include The Recommendation, Rent, Bachelorette and Assistance. He has been seen on-screen in Steve Jobs, A Single Man, The House Bunny and Now You See Me. Lowes and Shapiro join a cast led by Katharine McPhee as Jenna, Erich Bergen as Dr. Pomatter, Benny Elledge as Cal, Ben Thompson as Earl, Steve Vinovich as Joe and NaTasha Yvette Williams as Becky. Waitress features a book by Jessie Nelson, a score by Sara Bareilles, direction by Diane Paulus and choreography by Lorin Latarro. The show began previews on March 25, 2016 and officially opened on April 24, 2016.